I went to school for painting before I went for poetry. I kept a notebook in my painting studio, but the act of writing in a notebook is more like painting than editing a drafted poem: the body produces something the mind must have some part in but doesn’t seem to. There is an impulse that is put on paper or canvas, translated through the body. Even when sketching, there isn’t a great deal of conscious thought that goes into the line work—this may be muscle memory, the hand trained to create what my eyes take in. But we’ve been learning—training—to do things our entire lives. And at some level, an unleashed openness is what drives the making of any decent art, something more base than a learned technique. 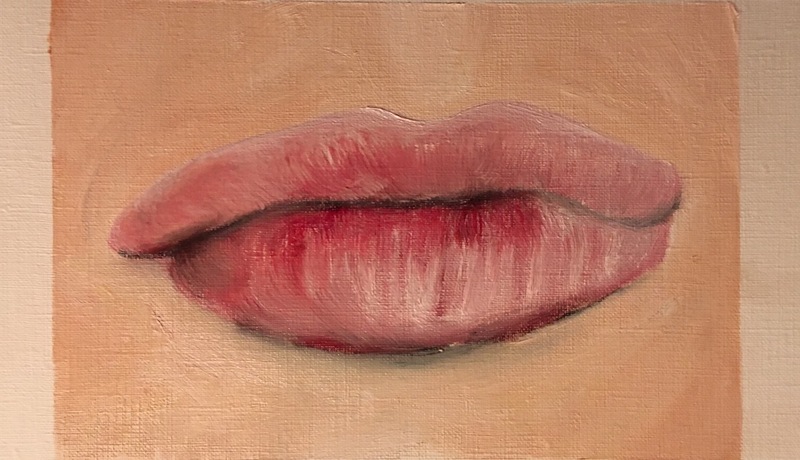 I began a series of painting sketches in early-February, a much-needed respite from drafting and editing a new poetry manuscript. 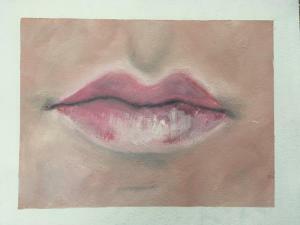 The sketches are of lips and each only takes fifteen to thirty minutes. A few women sat for me, but mostly I have worked from photos friends texted me, options for lips coming through disembodied, nose to neck. I didn’t recognize a number of them while others were unquestionable: I could have named them if I saw only their lips on a billboard. So while the process of eyes seeing, hands painting still occurred, there was an odd realization that I don’t see people as their whole. 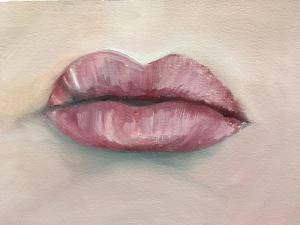 Even the painting sketches are my observation of these lips, and many are unrecognizable to me as the women who sent the images. My younger sister is a detail person; she takes in the whole of people, from how they move to the structure of their face. She is fascinated by people. As am I—you can’t paint portraiture and figures without that interest. But unlike my sister, my focus is on the texture of people—both how I feel around them and how it is their expressions rather than their features that I acknowledge, retain. 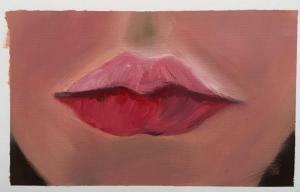 I may be the only one who sees someone a certain way until I paint it, share that image with viewers. If painting is indeed a physical act, then my body follows my eyes. So are my hands, my body, tools for my eyes? Or are my eyes tools for hands and body? And if the latter is the case, is my mind a tool for my hands and body as well? This is, of course, where science and philosophy could take over. And that isn’t my intention. That would be like sitting inside on a gorgeous day talking with your lover about rolling around in the grass with them rather than doing it, a cerebral look at compulsion rather than giving in to the impulse. Artists of all genres speak of a compulsion to create. Some even say they’d stop making if they could. A compulsion you can’t help but act upon can be a dangerous thing, regardless if it’s the mind or the body driving the impulse. A large part of the joy of making is following compulsive impulses, allowing my typically cerebral look at the world to fall away. And while the painting or poem created may be a window for others into an impulse, I believe that doesn’t diminish the feeling for me. 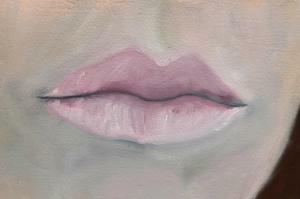 When I paint the lips of friends (whether I recognize them or not), my experience of them is only heightened, expanded. More texture is added to my composite or facsimile of them. Maybe when I directly address a part of someone or an object—or even an emotion—I am able to more vividly see that subject. I do not consider myself a technical writer or painter despite going to school to learn techniques of both. When we are at our finest as makers, we are completely unleashed, open. There is that moment watching a lover’s face after he’s come hard into you when his eyes look like he’s opened them for the first time, when you know you could ask him anything and he’d answer honestly and without hesitation. If the body is driving a painting, a poem, shouldn’t it have that stripped openness? Shouldn’t our creations reflect the core of us? Although I have little interest in exhibiting my paintings, I continue to make them. I am compelled to. And I am grateful. Painting is a reminder: write from the body; wait until editing to use the mind. Ciara Shuttleworth was born in San Francisco and grew up in Nebraska, Nevada, and Washington state. Her poetry has been published in journals and anthologies, including CONFRONTATION, Hayden's Ferry Review, The New Yorker, The Norton Introduction to Literature 11e, Ploughshares, The Southern Review, and Tahoma Literary Review. Shuttleworth received an MFA in poetry from University of Idaho, a BFA in painting/drawing from San Francisco Art Institute, and a BA in studio art from Gustavus Adolphus College. She was The Jack Kerouac Project of Orlando's 51st resident at Jack Kerouac House. Shuttleworth's poetry chapbook, Night Holds Its Own (Blue Horse Press), and her gonzo prose book, 4,500 Miles: Taking Jack Back on the Road (Humanitas Media Publishing), are available.